The Teeth Tomorrow® Referral Network is designed specifically for Specialists, Advanced Implant Dentists, and Dental Group Practices who want to receive more referrals from general dentists. This simple program enables Member Practices to enhance their relationships with referring dentists and exponentially grow their ability to identify and deliver Full-Arch restorations without exponentially increasing their advertising spend. Ten Thousand Baby-Boomers will turn 65 every day through 2030. By 2020, the aging and failing dental work of these patients will result in 37 Million candidates for Full-Arch restorations. This number balloons to 75 Million in the following 10 years. All of the Full-Arch Providers currently in practice aren’t enough to address this need. Less than 12 out of every 10,000 candidates will be able to receive treatment from a qualified restorative dentist. 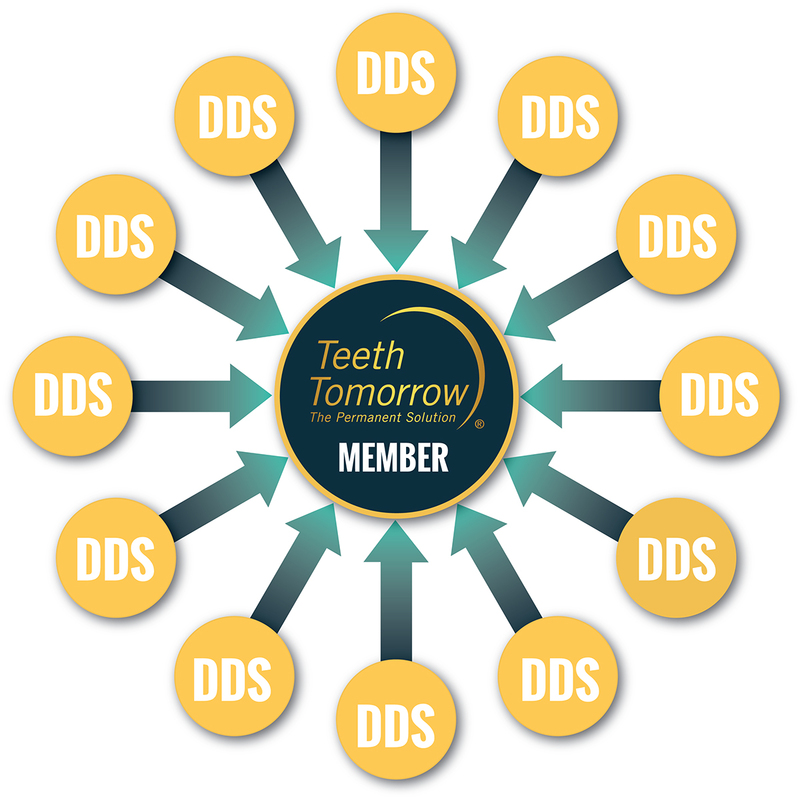 Teeth Tomorrow’s Referral Network Model is a Game Changer! Potential referring Doctors can be hesitant to recommend patients to “competitors” that provide similar/additional products and services because they risk losing their patients. Teeth Tomorrow’s referring Doctors can now offer a proven solution to their patient’s major dental problems. They will oversee each case and will be remunerated for their time spent and participation in the restorative process. The Doctors will continue to have a relationship with their patient by providing on-going care. Our team at Teeth Tomorrow® Network Support will help you through each step of the process – providing the personal assistance required to identify, Enroll, Train, and Support your referring dentists as you deliver the ONLY permanent solution with a 99+% in-service success rate (as documented in major studies published in the Journal of Prosthetic Dentistry). The Teeth Tomorrow® Network was built by Advanced Implant and Restorative Dentists to enable Member Practices and their referring dentists to deliver the best possible solution, with the highest levels of success, to the massive amount of patients suffering from major dental issues. The Industry-Leading Marketing, Education, and Training expertise and support of TischlerMET.